Happy New Year everyone. I hope you all have started off the year on the right foot and, to paraphrase Mark Twain, I hope you are not paving the road to hell with your resolutions already. I'm a little behind on my half Cannonball Read. Cannonball Read is 100 books in a year. I'm aiming for 50. I've already read "Northanger Abbey" (Jane Austin.) and am halfway through "Bird by Bird" by Anne Lamott. 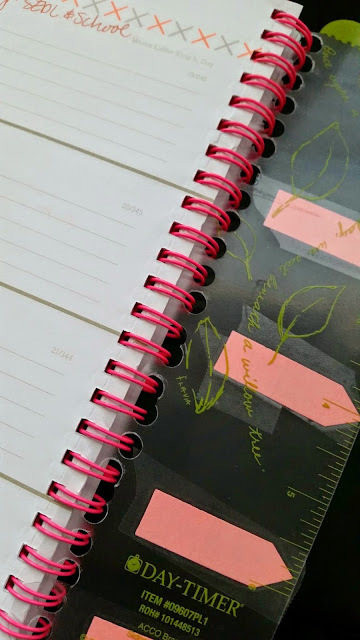 So, I know I promised a planner hack, but this could work with any kind of spiral bound notebook like journals or bullet journals. It's especially nice for information you need to carry over each week, like the kids' activities pictured below. You could use it for an intention, mantra, prayer, whatever you feel you need in front of your face that carries over from week to week. In my old binder, I had that information posted on sticky notes to my bookmark so I didn't have to re-write everything each week. I also liked how the bookmark was clear and I could see through to anything I had written underneath. 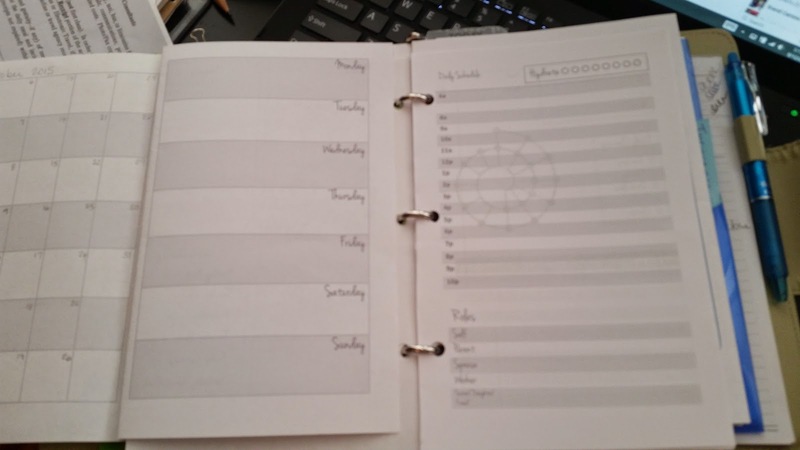 But this year I'm using a simple weekly ring-bound planner that did not come with a movable bookmark. 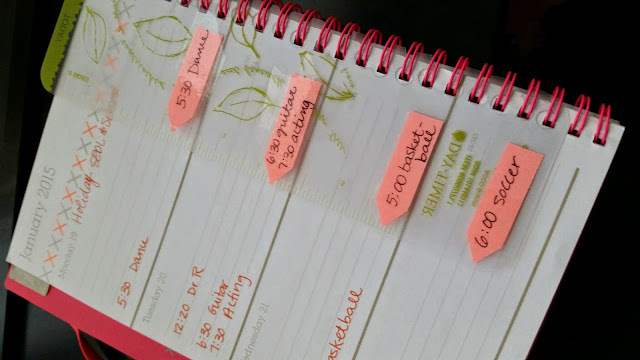 I didn't want to carry over sticky notes each week, or re-write (God-forbid! ), and besides, sticky notes take up valuable real estate on the page when you use weeklies. I decided I had no choice but to MacGyver one of my old Day Runner bookmarks. The challenge with this project is that the bookmark didn't fit (duh.) There weren't enough holes and the holes that were there didn't line up. I placed the bookmark over the planner and tried to line up as many holes as possible. 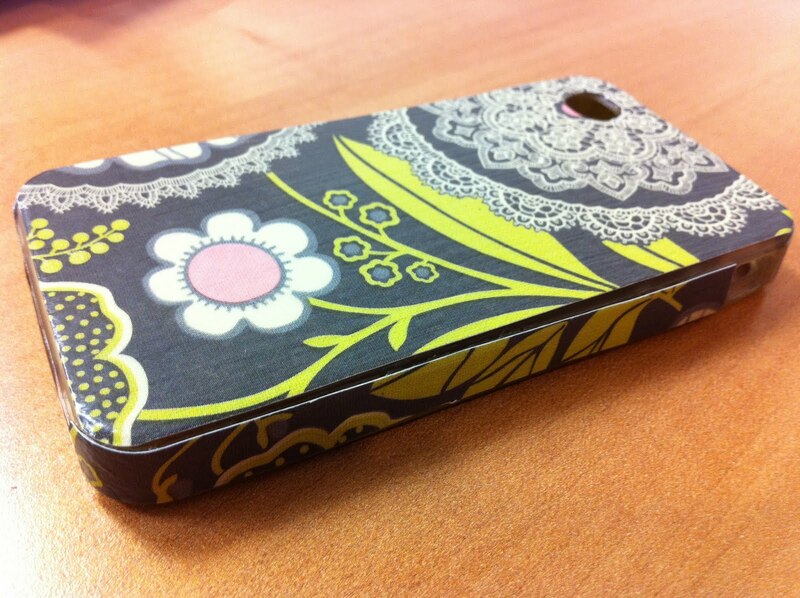 Then, I used a sharpie to mark where the other holes would need to be to line up with the rings (not pictured). After marking the holes, I used a single hole hole punch to punch out each mark. The top holes lined up pretty well, but by the time I got to the bottom, some of the new holes had to overlap with the old ones. That's okay. After punching all the holes, I cut notches into each hole. The v-shape makes it easier to insert and remove, trust me. Where the holes overlapped, I cut bigger notches. 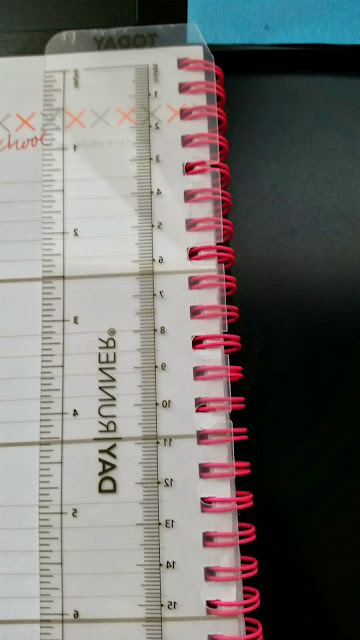 Then, I snapped the bookmark in by pushing the notches between the planner rings. When I took it out and replaced it several times to make sure it would hold up (it will), I used sticky arrows to mark each recurring appointment. I used clear tape to cover the stickies so they won't move. Now, I can move the bookmark each week and see my recurring appointments without having to re-write. Plus, the bookmark is clear so I can see if I have anything written underneath. And obviously, I can use the bookmark for its' intended use- marking the current day/week. Planning can be expensive and time-consuming. 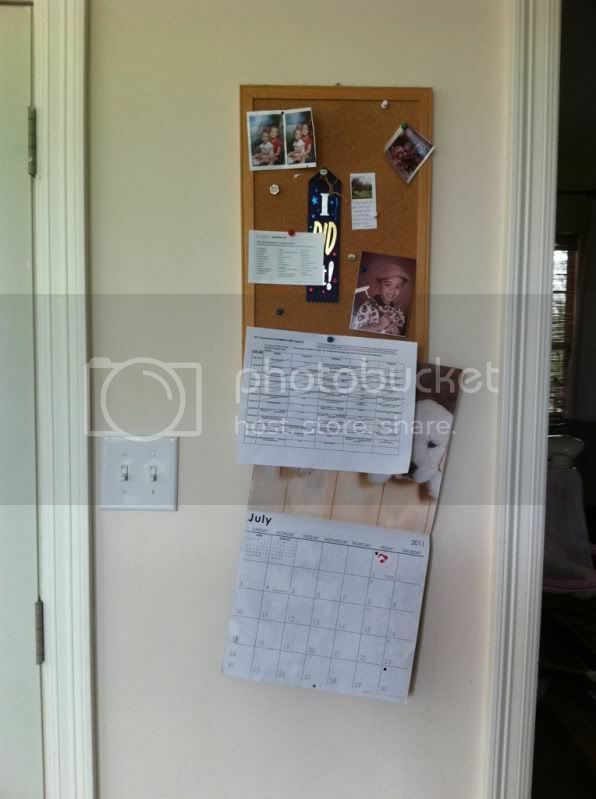 A little ingenuity can go a long way to saving you time and money. It took more time to create this blog post than to do the actual hack and my new bookmark will save me time and irritation from having to carry over my weeklies. First of all, I want to clarify that this is NOT a planner blog. It just so happens my last three posts were about planning because that's what's on my mind right now. In other words, I can't recommend or answer most of your questions about planning/planners. In other bad blogger news, I won't be linking to any of the projects I may mention here because, a. I'm lazy, and b. most of these things I had to pay for and then they bombarded me with advertisements anyway, so I'm kind of annoyed. 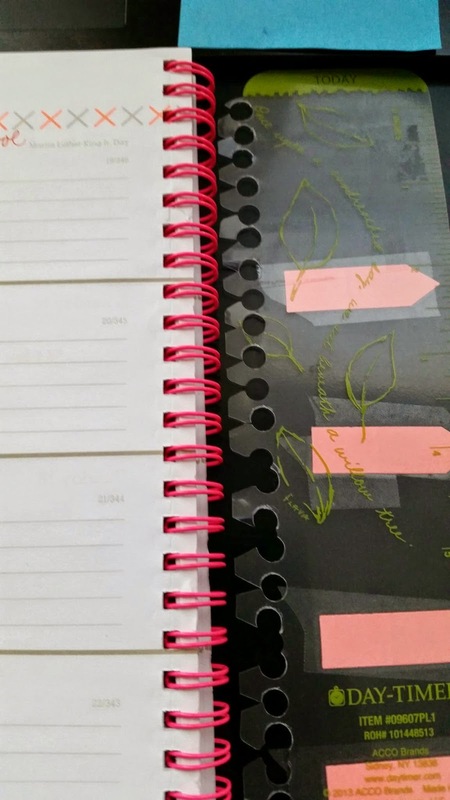 My Documented Life Planner- is a Moleskine planner that I use for art journaling. I'm doing the Documented Life challenge where you get a different theme to incorporate each week. There's a free FB group to join, and they do try to sell you stuff. Next is a regular composition book that I use for notes. 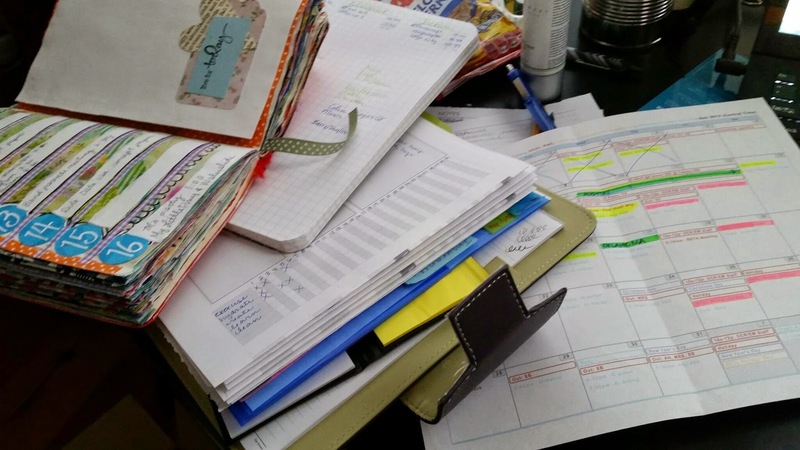 I spend most of my time at my desk and I just grab it and write- not very organized or efficient. 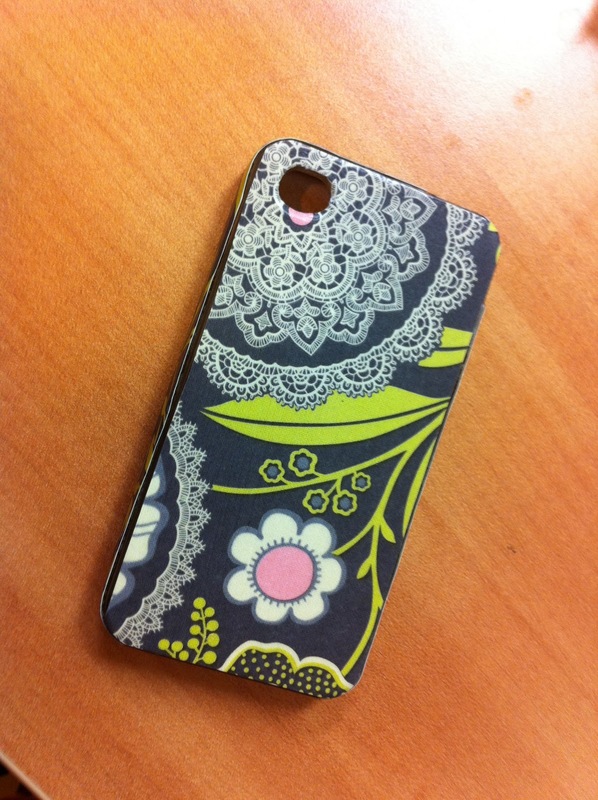 At the moment I'm using it to track Holiday shopping and wrapping so things and people don't get lost. 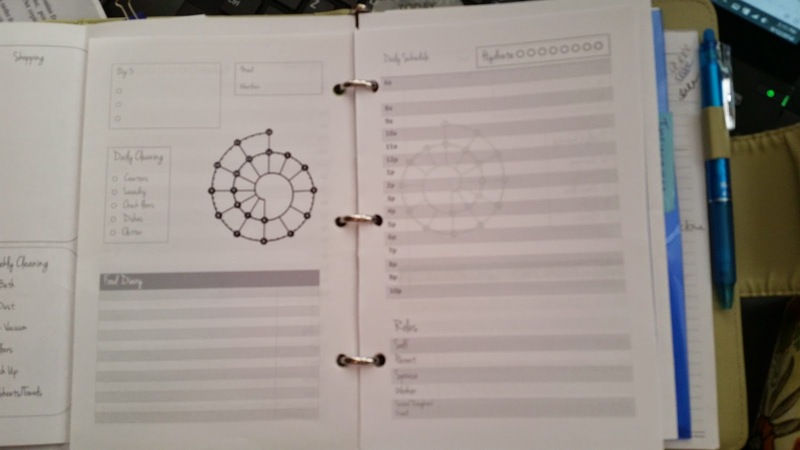 Then, there's my DayRunner planner with DIY inserts. I use this for detailed scheduling and general to-do's. I also track chores (when I do them) and exercise, water intake, weight, and time spent being creative or learning something new. Last, is a print-out of my Google calendar for work. It's got all the schedules for people I work with and isn't very efficient for personal planning. I do update all my appointment on here (set to private) so I can get notifications on my phone. Not pictured is a Life Book art journal (which I paid a boatload for and they still try to sell you stuff, so I won't be doing that again) and journal pages based on the Artist's Way process, which is three hand-written pages of brain-dump/free-writing each morning (sporadically, when I'm stressed or having a manic episode.) I never go back to those pages except to reflect on how things change and I don't consider them part of my planning or journaling. Also not pictured is Project Life. I bought all the supplies and only completed about 3 weeks worth out of the whole year. That one is supposed to be for scrapbooking and journaling. Now, seriously, if I needed to find anything in my notes (or my house really) I could do it in less than 5 minutes. My kids call it my mom superpower. I do, however, long for a more streamlined approach that still allows me to exercise my creativity and journaling while not compromising my organization or professionalism. All of these items in the photo above stay on my desk at all times and take up valuable real estate. To add to the mix is a pathological addiction to stationery and office supplies. Every time I see something new, I convince myself that it is the answer to all my prayers, and of course it never is. As I was reflecting this morning on what worked this year and what I want to try next year, my mind went back to Covey's quadrants (I go back to that often.) What is urgent/important, urgent/not important, not urgent/important, and not urgent/not important? That system works well for prioritizing tasks, but honestly a lot of what I do in terms of art journaling isn't reeeeaaaaly important to anyone but me. So, I thought of a new system. What if I replace "important" with "enjoyable," and "urgent" with "useful?" Now, I can rate all my extras with the new quadrants where the useful/enjoyable things get a front row ticket, and the not useful/not enjoyable things don't get a second thought. 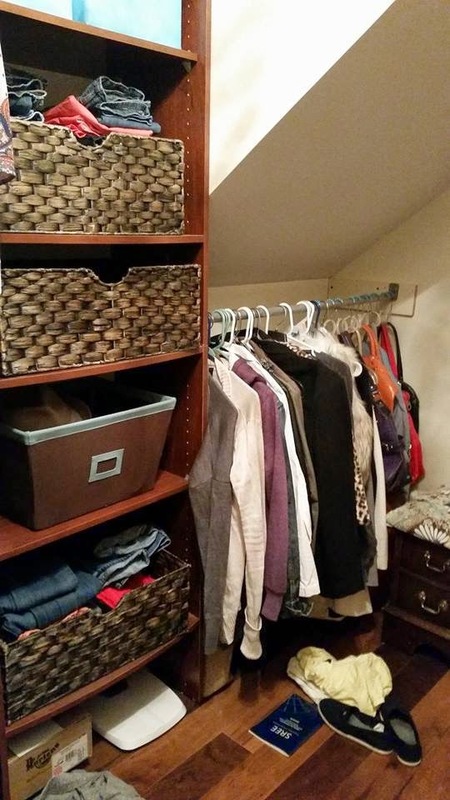 You could also make the same type of changes for cleaning out closets (fits/looks good), or culling books (enjoyable/ useful?) What about all those recipes (tasty/simple?) Using the two-criteria system for decisions makes it really easy to not over-think things. You only have to make sure your criteria are the the most important standards to what you're trying to rate. I'm not a Christmas person. At all. I'm sort of a Grinch actually. But there's one thing I start planning well in advance each year. I've learned from experience that if the planning doesn't get done, chaos ensues. 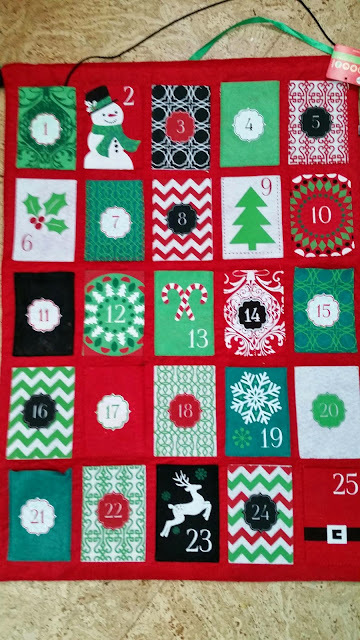 I'm talking about our annual advent calendar. I looked back and figured out we've been following this tradition since 2009. Last year, our house was packed up and we were trying to sell it. I didn't think I could handle all the work associated with the advent activities along with the four kids, the husband working and going to school full-time, the house-selling, and my little side gig I like to call a full-time job. To my surprise (and delight, really) the only thing the kids asked for were the advent activities. And, I say "only" because most of these activities are things that don't cost money, or were things we'd do anyway. The only difference is the surprise the kids get from revealing the day's activity. The calendar I'm using this year was 1/2 off at Joann's a few weeks ago. It's the kind where you move the marker from day to day, but I'm going to print out my activities and stuff them into the little pockets. This is the system I used last year. 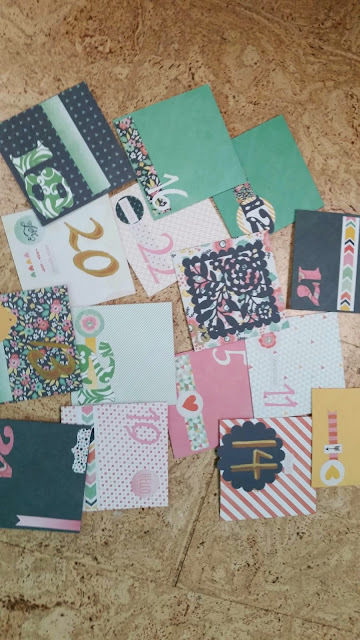 I made all of these envelopes and it was a disaster. They got all mixed up and torn and were just way too much work for something that won't last more than one year. I also made the mistake of putting all the activities in the envelopes in advance, so if I had to change something, I had to dig and find where it was. 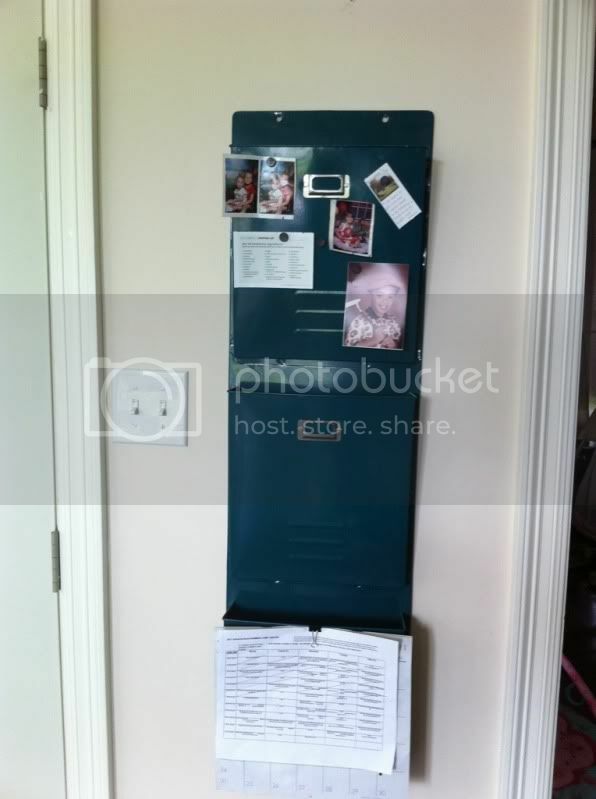 I can't find a photo of my original setup, but I used small metal tins attached to the fridge with magnets, similar to one found here. She's also got instructions on how to make them if you are so inclined. I like the tins because you can get lazy some days and put candy inside if you don't want to do an activity. I make sure to put the more complex activities on weekends and really easy things on days where we are more busy. I keep a master list of activities for myself and a copy for my husband. That way, we can see what's coming up and switch things around if needed. We used to include more spiritual activities like midnight Mass and reading scripture and there's no reason that you couldn't add more of those. 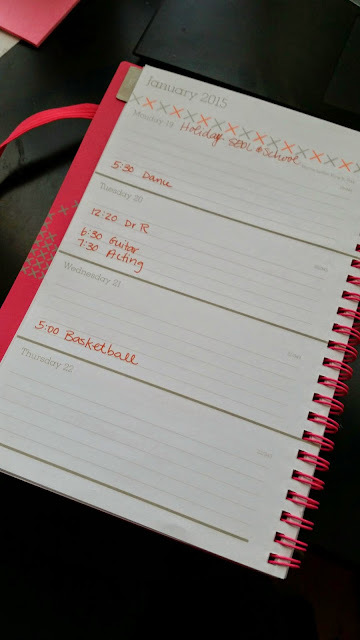 The kids always want to check the day's activity first thing in the morning, so you have to make sure it's a family event and the children aren't fighting over who gets to check. Over the years, I've made changes based on what works. During a given season, I make changes based on what works. It's okay- even imperative- to be flexible. Work with your schedule. We do family movie nights every Friday anyway, so I just added the stipulation that's it's a holiday movie we watch. Don't forget to take into account things you are already doing. Going to visit family? Either use that for your activity or make your activity something related to the visit. Looking at lights and displays along the way, for example. You also need to make sure you aren't scheduling something incompatible with your other plans. Don't say you're going to bake cookies if you won't be home all day. If you aren't crafty, don't schedule crafts. If you aren't a baker, don't schedule baking. Those are disasters waiting to happen if you aren't in full control of the situation. There are lots of other lists online, many with snow-related activities that aren't an option here in the La. or more spiritual or volunteer-based activities. The most important thing is to plan early and plan often. There are so many things going on during the season, this can easily get out of hand. You want to make it as simple as possible. These activities can be great distractions for kids on days off, or when you need to sneak out and get shopping done. Do what you need to do. Don't forget to look ahead to see what's coming up. Have stickers, color sheets, and candy on hand to switch out activities that aren't going to happen. Make sure the activities you select aren't going to add to the stress you are already experiencing. The best thing about doing Advent activities is that the kids get to spend more time with family, doing family things. There's less "me, me, me." I've even noticed Christmas lists getting shorter, but my kids are getting older, so who knows. Besides, there's always cocoa by the fire. 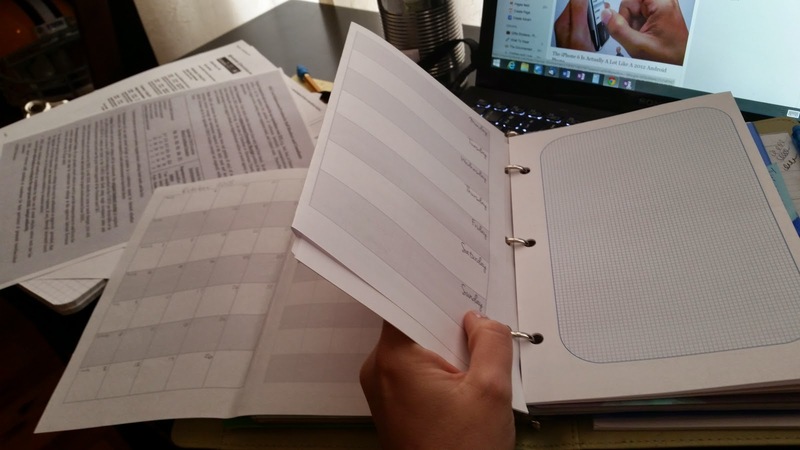 I'm sure most of you will agree that finding a planner that works for all of our quirks and obligations is a Quixotic journey. What worked for me in college (a week on two pages spread) is totally different than what worked while dissertating (mostly prayer and black magic.) 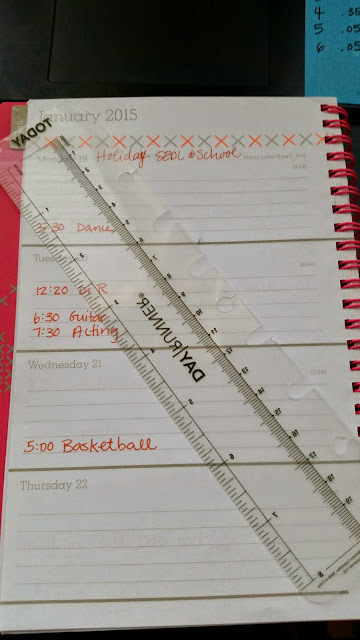 Now that I have kids (four) and a job and full-time working/schooling husband, plus a few things I need to remember, my planner just isn't cutting it. I've stolen a few great ideas from very smart people and designed my own spread that I'll try for the next month and, hopefully, with only a few tweaks, I'll have something useful. I'm going to share my spread here, but due to the obvious issues with stealing good ideas from smart people, I don't plan on making these public. The page above is the first page of my monthly spread. It's got my planning space based on Covey's rocks. Big Rocks are things that should get done first, little rocks are filler. He describes it much better than I do. This is the last page of my monthly spread. It's got the previous and next months' calendars. I'm probably going to change this next time because I forgot to make room for my mini-habits. The thing about the monthly spread is it is punched on the side of an 8.5 by 11' sheet and folds over in the middle- hamburger style for you teachers. 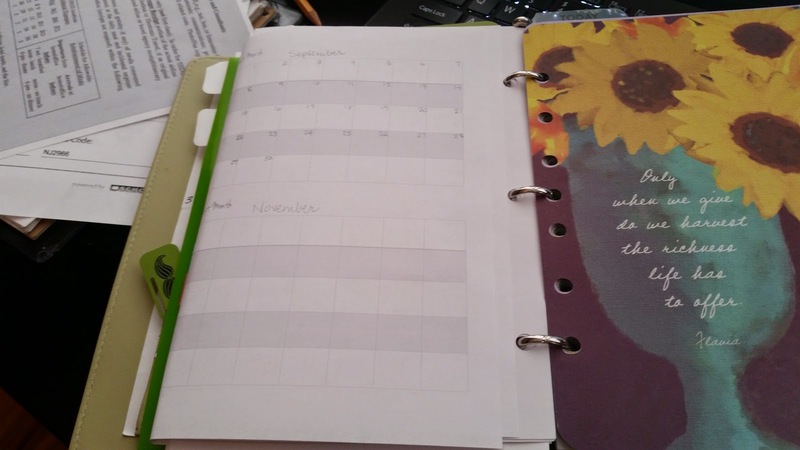 This way, I can keep my months' pages together and I can see my calendar while looking at my day and week because it's folded out. You'll recognize this from DIY Fish. 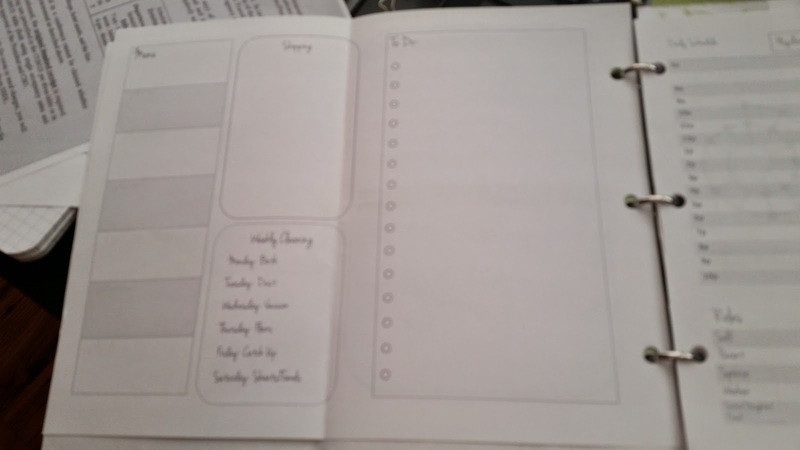 I've got my weight and spending trackers on the inside fold of this page so they will be hidden when the weekly page is turned. Spending and weight don't need to be visible most of the time anyway. 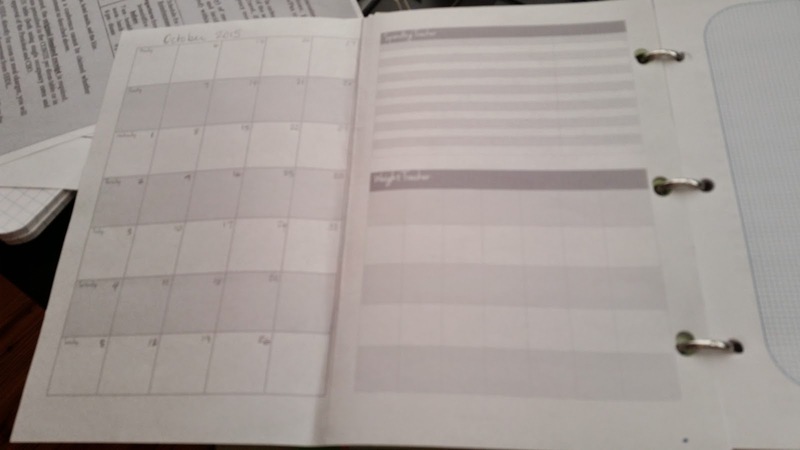 The weekly page is also punched on the side and folded in the middle to keep the daily pages together. In this photo, you see the folded week and unfolded month. So, I've got 7 day pages folded up into a week, and the weekly clusters get folded into a monthly cluster. It makes it very easy to flip to the month/week/day I need. 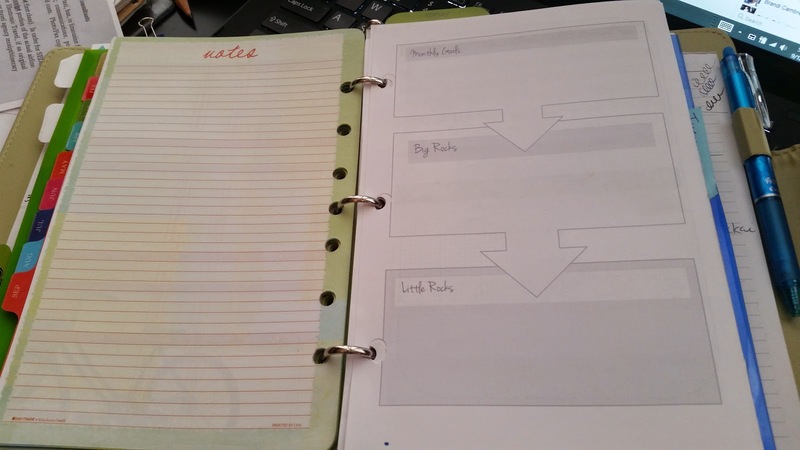 I can also add tabs if I want. You may have also noticed that my month is turned 90 degrees, with the dates going down the page, also stolen from DIY Fish. That way it matches up to the week-at-a-glance as pictured above. All the Mondays are at the top and Sundays are at the bottom. On the inside of my weekly page, I've got menu planning, shopping, weekly cleaning schedule, and "to-do"s for the week. These were the least important things I needed to account for, so I put them on the inside of the weekly page where they will be hidden most of the time. I may change that if it doesn't work out. As for now, hopefully, my monthly, weekly, and daily planning will all flow from left to right with the important pages visible at all times. No flipping back and forth. I was always very resistant to using a page-a day because I didn't think I had enough stuff to write. Now that I'm in the full swing of school and kids' activities, I realize I now need to write EVERYTHING- no matter how trivial, because I can't remember ANYTHING. Now, my daily pages are cut and punched like normal. On the left-hand side, I've got tracking. I tried to have as little writing space on that side because I don't like trying to write over the rings. I've got a food diary there, but I don't know if I'll keep it. I've also got a sprialdex for time-tracking, My Big Three items to get done for the day, a daily cleaning checklist, and a space for mood and weather for journaling. On the right-hand side is my daily agenda. I don't know what happened to 7am. It got lost in printing. I've also got a hydration checklist and a space to remember to pay equal attention to all my roles daily. Here's where the magic happens. I wish I could take credit for thinking of this, but it was Fish so go check her out. 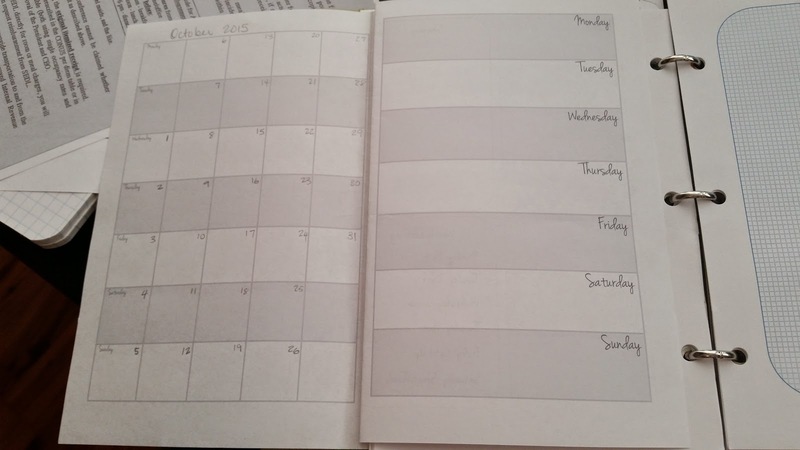 This last photo shows how it looks when the 7 daily pages are folded into the week. On the back side of the weekly page is a graph-paper area for notes or whatever. Yes, my pages are hanging out. I punched them wrong and I can't find my hole reinforcers to fix it. If you need help visualizing how any of these components work, there are tons of videos online for using Big Rocks, Sprialdex, and DIY Fish. I encourage you to go look at those if you haven't yet. 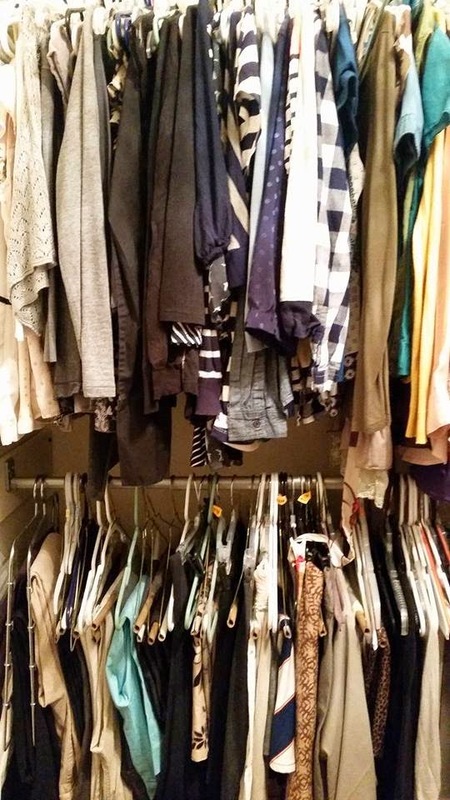 This is what my closet looked like two weeks ago. I didn't count shoes and jewelry. 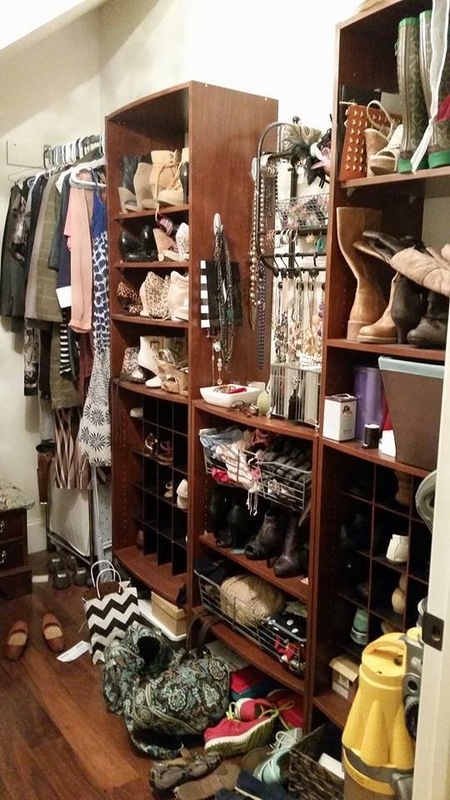 You are given a pass on workout clothes, underwear, and pajamas, but not shoes and jewelry. 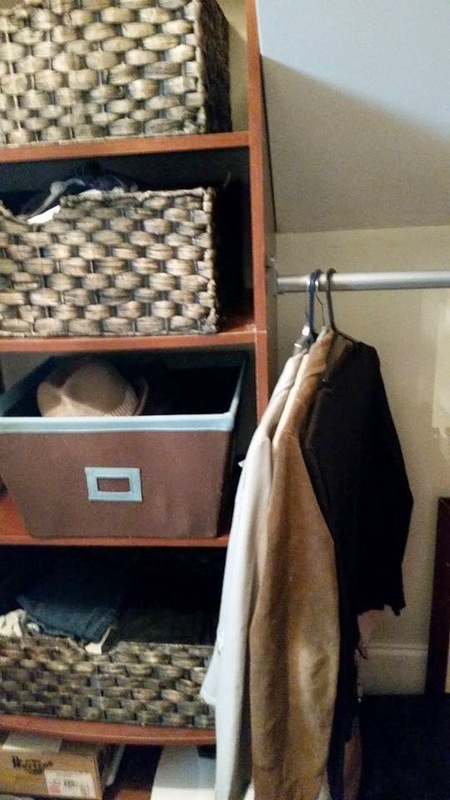 I didn't think I could make a small wardrobe work without the extra shoe and jewelry options. I'm realizing that's not the case. My lifestyle is a little different than when I felt like I needed flashy shoes and accessories and I just don't like them anymore. I'm going to get rid of a bunch soon like earring that are too heavy and bracelets that are too noisy. I went over the 33 item limit. I ended up saving about 50 things. I also made the mistake of asking my husband to put my 6 (six!) bags of clothes that didn't make it into the attic and of course, he didn't. So the first day, I had a panic and went straight for the bags, pulling things out. I had a "come to Jesus" moment though and put everything back (in the bags, not the closet.) I also put the bags in the attic myself so I didn't have that option again. 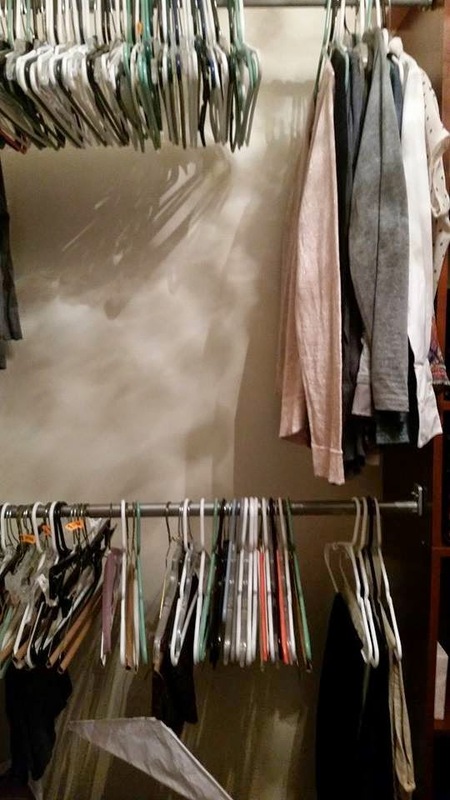 Last weekend, my sister sent 3 bags of clothes to my daughter. Looking at all the boutique and high-end cast-offs, I kept a few things for myself. I never said I was an image of self-control. I kept too many "fantasy" items. These are things I bought because I wanted to be the kind of person who wore them. 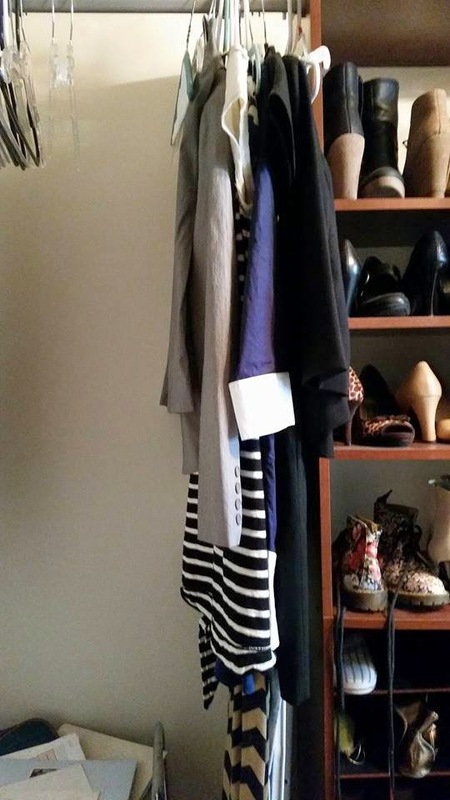 A JCrew dress and Anthropologie dress, to be specific. I paid a lot for them, and really like them, but I can see I'm not going to wear them. I've got a business trip coming up and if I can't bring myself to pack them, they're going to have to go. I still got rid of a boat-load of stuff. Besides the 6 (six!) space bags full of stuff in the attic, I also sent 3 (three!) garbage bags of stuff to charity. My dresser is almost completely empty except for pj's and workout stuff and underwear and you've seen my closet. I haven't taken any more stuff out. I switched a few dress pants for jeans when I got the opportunity to start working from home, but (except for my sister's stuff) the overall count has gone down, not up. I'm figuring out my style. Luckily, that seems to be French casual. I've got navy stripes, boatnecks, and a trench coat. Flats, white tees, jeans, and leather pants(!) and I love them all. For the longest time, I wore mostly preppy clothes. Polos, colored jeans, "mom" clothes, and I never felt like "me." I looked ok, and I thought that was what counted. Well, now I want to look Good and FEEL Good. Goodbye capris and flip flops! I'm going to be honest, P333 isn't for everyone, but it SHOULD be. There are so many reasons to cut down on our consumerism, from ecological and human rights issues, to freeing ourselves from the chains of the earning-spending cycle. I hope one day I can get my wants down to only my needs so I can free up my time for living instead of spending-earning. I want to be able to pack up and move without having to rent a whole caravan of moving vans and I definitely don't want my kids to have to deal with an overwhelming bunch of crap should something happen to me. It's going to be a journey, but I'm packing light. The following is a journal entry I wrote today on having Bipolar Disorder and being in the middle of an episode. I thought it needed to be public. I am lost. I’m sitting at my desk with a paper next to me and a couple of books in my head and I can’t figure out how to move my brain to address any of those issues. I’ve got a sudden longing to be home, raising my kids. But I can’t trust that any of my feelings are real. I was too trustful in 2007 when I dropped everything to return to the classroom so I could be nearer my children on holidays and Margaret could attend pre-k with me every day. I came home after the first day and wept, because I knew I made a huge mistake. It worked out ok in the end. Everything does, really. Nothing stays horrible forever. But, God, was it horrible. I don’t know why my brain goes back there so often. I re-live the regret, the fear, and the shame of trusting feelings that were so strong, but still betrayed me in the end. And I feel bad for the students who got a really bad teacher that year. I feel like I can’t trust anything right now. I’m afraid to take any challenges. I don’t know what I want, and today I’m not really sure who I am. I’m a tangle of hormones, neurons, medications, chemistry and biology, all mixing together in a bubbling cauldron. All of them plotting to keep me alive, or possibly destroy me at any time. They say treating mental illness is a delicate balance. They don’t explain that what it really means is that there is a small window of success and otherwise a whole mess of fear, loathing, loneliness, and paralysis. There are things I know: I am relatively healthy and successful, I have everything I could ever need and then some. I have a supportive husband and smart, beautiful, and mostly well-behaved and well-adjusted children. But still my mind stirs and whirls in a tornado of expectations and false deadlines. My brain tells me I need to do everything. It tells me I want everything. It tells me I hate my job and love my job. It tells me I need to move to New England. However, it also tells me I am enough. I do enough. I have enough. I’d like to trust the positive assessments, but my mind has lied to me before, in spectacular fashion. I can’t trust it. It does not have my best interest at heart. It beats me down and then flatters me like an abusive spouse. It sets up a list of obstacles, disguised as achievements that I need to accomplish so I can be whole; then it steps on my shoelaces as I try to move forward. I think I could trust the medication if I knew it was the one handing out the script, but the hormones and neurons and past experiences that trigger responses like Pavlov’s dog are wonderful actors. Wonderful frauds like the hypocritical preachers in mega churches that ask you for money and tell you you’re going to hell and that predict the end of the world on Tuesday or that God will strike them down unless they get a new Mercedes. So convincing, but never having your best interest in mind. Scored a neat organizer from the best Grad Assistant in the world who is moving out to Oregon to change the world. I think it looks much better than my previous system, which was "pile everything onto a cork board and pray it doesn't fall." Sean suggested I paint it, and I just might. 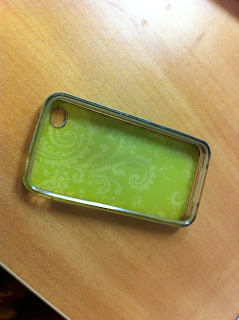 I'll see if I can figure out how to make it look distressed first. My old, clear iPhone case was getting yellow so I figured it was time for a new one. It's amazing how much people charge for these things. So I broke out the old Mod Podge and some leftover Amy Butler scrapbooking paper I had lying around and covered the outside of the case. The paper was double-sided, so it shows through on the inside. I covered the buttons and they still work fine. I just covered between the holes for connections so I wouldn't have to cut them all out. Of course, I cut out the oval for the camera hole.It hasn't really been kid-tested yet, but it seems like it's pretty sturdy. The Mod Podge makes the case a little stiff, so it's hard to get the phone out, but not impossible.